30 November 2018: It was a hive of activity on the University of Canberra campus this week as over 700 high school students from across New South Wales visited UC to experience genuine university life. As part of UC’s Widening Participation program, Year 9 and 10 high school students from 16 regional high schools were given the opportunity to experience the university as part of the annual UC 4 Yourself Experience Days initiative. Students spent one of the three days set aside for the initiative at the Bruce campus and were hosted by the University’s Widening Participation team. “The days are designed to inspire students to consider higher education as an attainable and valuable option and broaden their understanding of the degrees and career prospects,” said Rebecca Mason, Senior Coordinator of Widening Participation. The initiative aims to highlight the benefits of higher education for students from backgrounds traditionally underrepresented in higher education, including students from rural and regional communities, financially disadvantaged schools, Aboriginal and Torres Strait Islander backgrounds, and from families with limited prior experience of higher education. “UC’s Aspirations Agents are well trained and can relate to the high school students as they stem from similar backgrounds to the visiting students. Acting as hosts, taking the students on engaging campus tours and visits to the on-campus accommodation facilities in a fun, educational and informative format brings the university to life,” said Ms Mason. Year 10 student of Jindabyne Central School Marlee Diver said that the day changed her perception of university. “I came into today knowing next to nothing, but the day was helpful in giving me an understanding of university life,” she said. The UC 4 Yourself Expo held in the Refectory showcased interactive demonstrations by staff and current UC students. 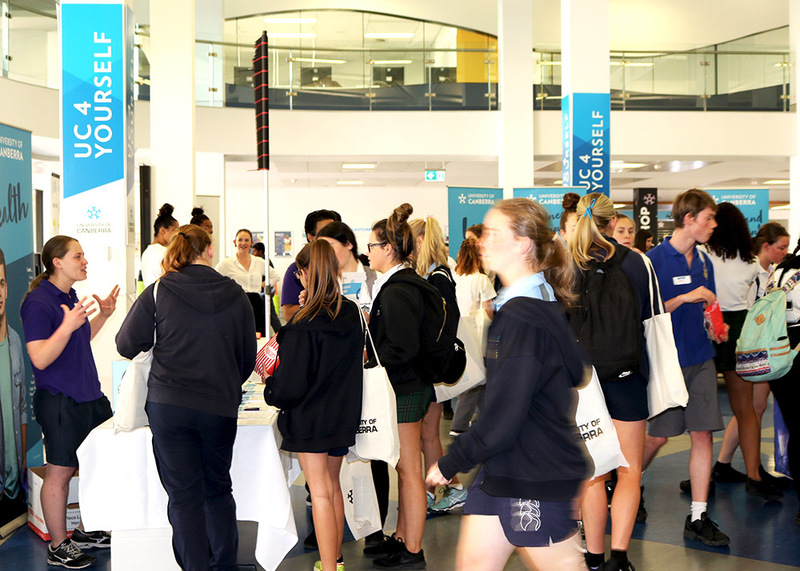 With over 25 workshops, 32 tours and 15 business units, disciplines or faculties involved in the days, the prospective students learnt about the University’s support services, alternative pathway programs through the University of Canberra College and programs such as study abroad, the Australian Indigenous Mentoring Experience initiative, the elite athlete program and more. Elliza Dickie, also of Jindabyne Central School, said that the day had broken down her perception of university life that all students are ‘broke and sad’. “The day highlighted, for me, the many areas of university life and the social activities I could participate in,” she said. “Today has made me reconsider my electives for next year. After learning about the different degrees and flexibility in formulating how we can balance studies, a social life and job has been enlightening,” Ms Diver said. The UC 4 Yourself Experience Days have had an impact on prospective student’s perceptions and post-college aspirations over the past six years. Rayna Green, Careers Advisor at Jindabyne Central School, saw the impact first-hand as her Year 10 group realised that higher education is within their reach. “We come from a rural area, so it has been fantastic for the students to see that they can set their goals on attending UC in the future. They have been able to see where they could fit it and realised that they can study, work, live and socialise in this setting,” she said. “Many of these students couldn’t see themselves attending university but today it became personal and they are now able to see themselves being part of this environment in the future,” concluded Ms Green.